Weekend Box Office: Is it game over for Adam Sandler? Nostalgia is a fickle mistress, especially when it comes to the tricky business of selling a movie. Why will audiences shell out for one shameless shrine to a seminal special-effects movie of their youth, but not another? And if the Teenage Mutant Ninja Turtles can be stars again, why can’t Pacman and Donkey Kong manage a similar comeback? In the latter case, maybe it’s just the company they’re keeping, a ’90s icon whose comedic heyday seems about as ancient as the 8-bit era. Seven weeks after its record-breaking debut, Jurassic World became the third-biggest hit in both global and domestic box-office history, fond memories of its 1993 predecessor presumably helping carry it past The Avengers. (The film will need some kind of extra push to overtake Titanic, whose second-place position on the all-time U.S. charts is still about $30 million away.) Meanwhile, over the same three-day stretch, the latest shrug of a comedy from Adam Sandler massively underperformed. 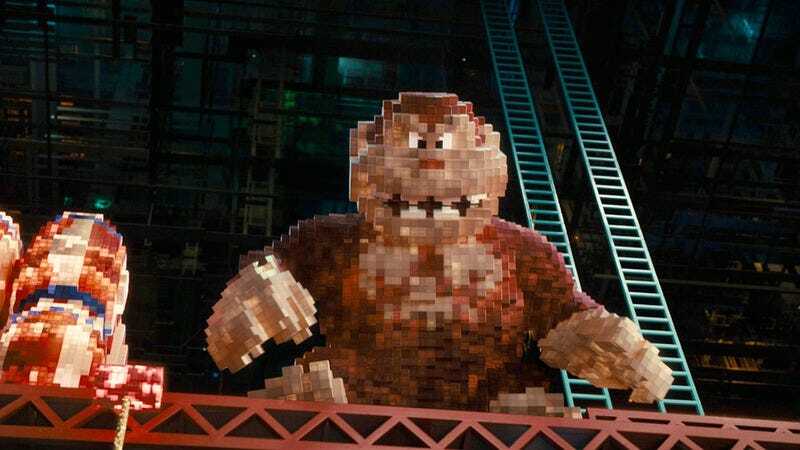 Pixels made just $24 million on about 3,700 screens—not the worst opening for a Happy Madison production, but pretty bad for a movie that cost $88 million. Between this and the low intake of last summer’s official Sandler vehicle, Blended, have audiences finally gotten wise to the sheer laziness of this SNL alum? Are Sandler’s glory days of winning big by thinking small behind him? Hold your applause until we all see how the inevitable Grown Ups 3 does opening weekend. With Pixels taking a major barrel to the chest—or a centipede to the head, choose your classic-arcade poison—Ant-Man retained its position at the top of the U.S. box-office heap with another $24.7 million. If Marvel isn’t celebrating as loudly as they usually have occasion to, it’s because the Paul Rudd superhero flick remains the low grosser on the MCU totem pole: At just $106 million (or about half of what Age Of Ultron made in its first weekend), the film might not even catch 2008’s The Incredible Hulk. The likelihood of a solo sequel seems somewhat slim, though we can probably count on Ant-Man becoming an auxiliary player in future Avengers movies. Though he certainly looks buff enough to join Earth’s mightiest heroes, Jake Gyllenhaal couldn’t parlay his impressive new physique into even an Ant-Man-sized hit. Southpaw, the boxing drama he got beefy for, made a solid $16.5 million at the bell, which was at least enough to put it past the new John Greene adaptation. Paper Towns opened to $12.5 million, a good deal less than what The Fault In Our Stars managed in its first weekend. Seems safe to assume Fox is feeling mighty nostalgic for last summer.